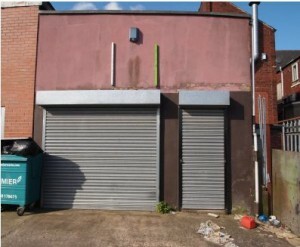 Store or light industrial workshop with additional first floor storage. Gross internal areas Workshop 466 ft2, Store 279 ft2 first floor store 450 ft2. The property is situated to the rear of 282 Great North Road with access off either Cemetery Road or Windmill Balk Lane. The information contained in these particulars is made without the responsibility and do not constitute the whole or any part of an offer or contract. Any description, image, dimension, distance or area given or any reference made to condition, working order or availability of services or facilities, fixtures or fittings, any guarantee or warranty or statutory or any other permission or approval or reference to suitability for use or occupation, photograph, plan, drawing, aspect or financial or investment information or tenancy and title deeds or any other information set out in these particulars or otherwise provided shall not be relied on as statement or representations of fact or at all and any prospective buyer or tenant must satisfy themselves by inspection or otherwise as to the accuracy of all information or suitability of the property. No employee of Craven Wildsmith has any authority to make or give any representation or warranty rising from these particulars or otherwise or enter into any contract whatsoever in relation to the property in respect of any prospect purchase or letting including in respect of any resale potential or value at all. Price or rent maybe subject to VAT and any prospective buyer or tenant must satisfy themselves concerning the correct VAT position. Except in respect of death or personal injury caused by the negligence of Craven Wildsmith or its employees or agents, Craven Wildsmith will not be liability, whether in negligence or otherwise howsoever for any loss from the use of these particulars or any information provided in respect of the property safe to the extent that any statement or information has been made or given fraudulently by Craven Wildsmith. In the case of new development or refurbishment prospective buyers or tenants should not rely on any artists impression or architects drawings or specification or scope of works or amenities, infrastructure or services, or information concerning views, character or appearance and timing concerning availability or occupation and the prospective buyers or tenants must take legal advise to ensure that any expectations they may have are provided for direct with the seller or landlord and Craven Wildsmith shall have no liability whatsoever concerning any variation or discrepancy in connection with such matters.